Some are new (with or without tags) some are used/excellent condition. Genuine Issue! 50/50 Cotton/Nylon = NYCO fabric! New and Used/Good condition Each piece sold separately for your buying convenience. Genuine Issue! Glenn sells each piece separately so you can mix and match and only purchase what you want/need! Genuine Issue for the United States Marine Corp Olive Drab Physical Training Sweathshirt. Globe, Eagle & Anchor on the upper left breast with USMC under the logo. NSN and Contract #'s on inside tags. 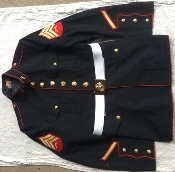 Set includes Windsuit Jacket and Pants, EGA PT One Set available size Medium, great Marine Corp - Army Surplus item!